The Tower follows the Devil for good reason. The Devil is a creation of culture. He is a late arriving player in the story of Christian mythos, but a profoundly powerful figure nonetheless. He is created for cultures with much to hide. The presence of The Devil in cultural mythos indicates a culture bonded by a need for secrets and the lies they inevitably become. Secrecy is the bond of The Devil. The Tower reveals every secret—1, 2, 3—The Tower reveals lies and inconsistency. The Tower snatches viels as it crashes walls and opens doors. If you have something to hide, The Tower will free you of that weight. If you have lived informed by a lie, The Tower will free you of that weight. 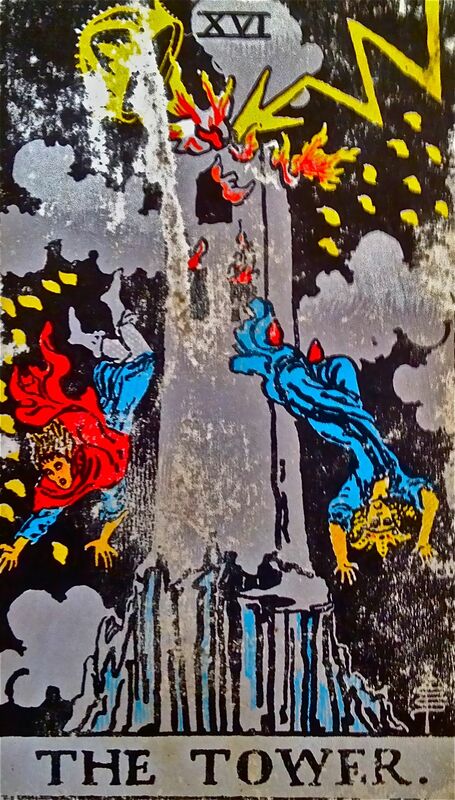 The Tower will free you, ready or not and it falls chaotic because it’s collapse is based in necessity. The Tower reveals those parts of yourself or behaviors (or other persons or circumstances) that you would avoid seeing if given any chance to do so. The Tower is what must happen in order to bring alignment, to bring about balance. The Tower breaks the bonds of secrecy and calls the Devil’s bluff. The Tower snatches up the viels of night and tears apart the contracts of man. The Tower is the greatest of all dispellings. And it will come. Does come in time. Or as Joan Jett put it . . . CLICK . . .